Wufengqi Waterfalls are the most famous of all the waterfalls in Jiaoxi. 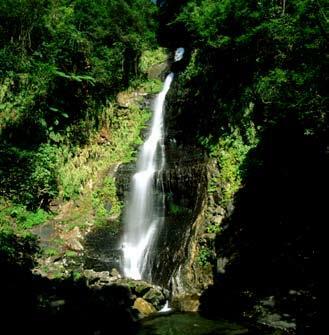 The name comes from the falls being in front of five steep mountains. The Kavalan Chronicles wrote they are "…named for the shape with five mountains lining up to resemble standing flags…". Therefore, the waterfalls have become a popular tourist attraction. Wufengqi Waterfalls have been developed into a scenic area. The Viewing Pavilion offers a spectacular view out onto the green mountains. The top of the falls sits inside a narrow mountain chasm and flows at great speed. The bottom of the falls ends at the entrance to the Wufengqi Scenic Area where playing areas are designed for children. The water is clear and crisp, so the tourists rush in on holidays to enjoy the water and picnics. It is a perfect place to have a family outing.